You can serve your bacon wrapped scallops as is, or make a fun sauce to go along with them. Spicy mayo, a cheese sauce, or even introducing some teriyaki sauce whilest searing your scallops are all awesome choices. Bon apetit. scallops as many as your heart desires! Heat a medium sized skillet to medium heat. Once the pan is heated up coat it with coconut oil spray. Add your bacon. Cook the bacon until it is crispy, but not too crispy that it crumbles while wrapping the outside of your scallops. Take the bacon off of the skillet. Wipe the pan clean. Continue to Heat your medium sized pan on medium heat. Pat your scallops dry, and season each side with salt and pepper. Place a generous portion of butter in your skillet to coat the pan. Once the butter evenly coats the pan, add your scallops. Sear the scallops until their golden brown on each side (roughly 2 minutes). 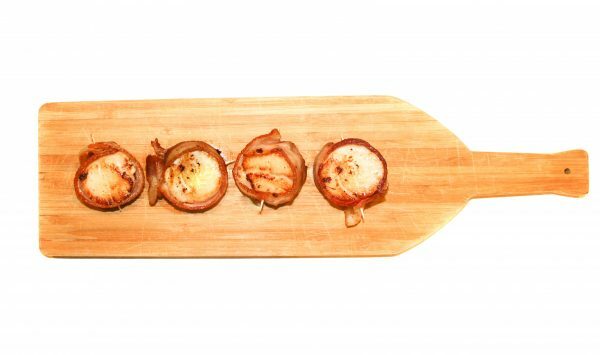 Remove seared scallops from pan, and wrap a slice of your cooked bacon around each one. Use a toothpick to hold the bacon in place. Place the bacon wrapped scallops back into the pan to marry the flavors (one minute or less) flipping halfway through. Remove from heat. If you enjoy adding acidity to your scallops, squeeze some lemon over the finished product.